I like silhouettes. That's always been one of my favorite ways to make a photograph. They're somewhat mysterious, intriguing, and leave something to be imagined by the viewer. The concept is that the subject is dark, defined by shape, and is illustrated by the color around it. With this image I wanted to suggest the passing of time, from day to night. I like the strength of the tree, the gracefulness of the barren branches and the tiny shapes caught within. Photographing after sunset allowed for a quiet sky with a golden glow, followed by impending twilight. To enhance the idea of the transition to nightfall, I used Nik Color Efex Pro to intensify the blue sky. 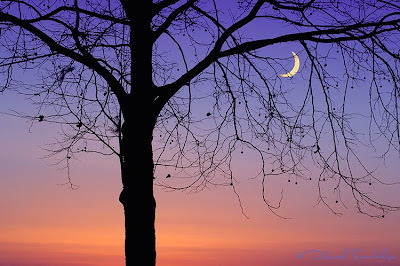 To complete my story, I added a crescent moon, like the ones I remember from childhood books.